Jeffrey Smart’s move to Italy in 1965 summoned his full flowering as an artist. In the ancient city of Rome, nearby port harbour of Ostia and the adjacent airfields of Fiumicino, Smart found the crisp, urban forms, dramatic contrasts of colour and light and intricately patinated surfaces that we now recognise as intrinsic to his painting. Smart was someone who revelled in the old and the new – his art was a synthesis of classical formulas and forms integrated with scenes and compositions taken from everyday life. Ostia is a port, archaeological site and resort town located about 30 kilometres from the centre of Rome, on the Tyrrhenian coast. With the establishment of many hotels and bathing establishments after World War II, the town became a mecca for Romans seeking to escape the heat of summer, as well as a place of permanent residence for a lucky few. 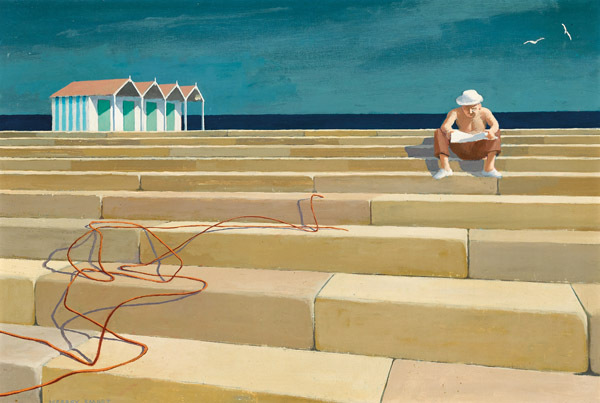 Jeffrey Smart and his artist companion Ian Bent were frequent visitors and it is not surprising that scenes from Ostia feature in many of Smart’s works, both directly and indirectly. Second Study for Ostia 1969-70, is one of a select group of works that Smart painted from his studio in Rome. Each work features the motif of a man sitting on steps casually reading a newspaper. Behind him is a group of bathing boxes and beyond that the sea. There are three known versions of this work, as well as several smaller drawings and pencil studies of the figure. The three paintings stand alone but show subtle differences in technique and striking variations in the compositions. First Study for Ostia, 1969-70 (private collection), is perhaps the more spontaneous looking of the three. The brushwork is clearly visible and there is a thin layering of paint. Although the same size, Second Study for Ostia takes the essential qualities of the first work and develops them into something enduring and more resolved. Extraneous details that may have detracted from the clarity of the scene have been removed – the railing and rendered block masonry walls, for example – so that in the second study there is an unbroken vista that stretches from the bottom of the steps to the sky and sea. The man reading has been relocated from the right to left and set further back so that he appears less prominent. In a third major change between the first and the second painting, the bathing boxes have been consolidated into a single row, also moved to the left, and arranged at an oblique angle to the picture surface. The cumulative effect of these changes is that the feel and composition of Second Study for Ostia is close to the artist’s stated aims. It is a scene of calm and repose, built on parallel lines and contrasting bands of colour. The warm blocks of yellow used to define the stone steps are beautifully rendered in a heavily laid pigment and glow against the darker and more saturated blue hues that define the sky and sea. The division of the picture into horizontal bands using a two-thirds/one-third ratio further unites and activates the composition. Into this mix, Smart introduces an intriguing variation with a trailing umbilical cord of electrical wire that writhes and doubles back. We are not given any clues as to why the cord might be there. We just know that it is integral to the restrained formal geometry of the picture and helps to further bring it to life. Second Study for Ostia was exhibited alongside its two companion paintings in Jeffrey Smart’s important exhibition at Leicester Galleries, London, in 1970. According to the artist, the show was ‘amazingly successful’ both in terms of sales and in its critical response.1 As a sign of his own approval, Smart continued to reuse elements of the Ostia paintings in later compositions. The unruly cord went through a series of refinements and permutations and may be the basis for the later Portrait of David Malouf, 1980, held in the Art Gallery of Western Australia’s collection.